My blog is now six months old, and this is my thirtieth review! Thank you all for your continued interest in my very-niche-interest blog, and please continue to keep reading! This week I am venturing into the wide world of Dear Canada! One of the most interesting things I’ve found in studying these books is how the DC books present a different counterpoint to the Dear America books covering the same time period. For an example, since last week I did the DA book on the Titanic, this week I’m going to cover the DC Titanic book. 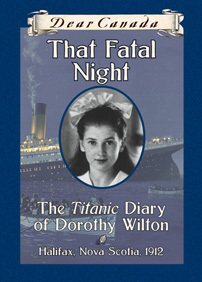 That Fatal Night: The Titanic Diary of Dorothy Wilton, Halifax, Nova Scotia, 1912, Sarah Ellis, 2011. I’m quite biased, as a rule—I think the Dear Canada books are as a whole, better-written and better at covering a given subject matter. They present more cohesive stories and generally seem to create a better, more evocative, more nuanced picture. If you ask me. Which no one did, but this is my blog and I get to say what I want. This is a Dear America that properly doesn’t even belong in the canon, as it is about a British girl who only actually sets foot in America over the last three pages. But this probably falls under Being Too Picky. 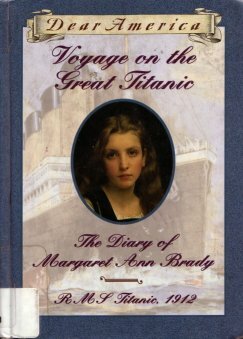 Voyage on the Great Titanic, The Diary of Margaret Ann Brady: R.M.S. Titanic, 1912, Ellen Emerson White, 1998. There’s an awful lot of Titanic stories out there, and it’s somewhat overdone—we all know the story of the Titanic by now, so it’s hard to put a good, interesting spin on it. This came out the year after the film did, so it was capitalizing on a wave of Titanic-sentiment around that time. However, Ellen Emerson White does a nice job of creating a strong character in a fairly uninteresting story, and it’s a nice introduction to the story for younger readers. 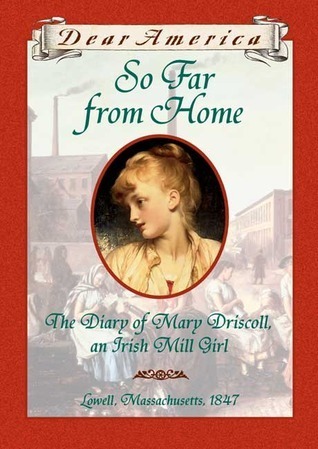 So Far From Home: The Diary of Mary Driscoll, an Irish Mill Girl, Lowell, Massachusetts, 1847, Barry Denenberg, 1997. If you see that name in the title you can probably figure out what my verdict is going to be, but let’s do this anyway. My main problem with this book is that Denenberg has created a terribly stereotypical character who even writes using a vague dialect. It’s all very strange and dreamy and kind of terrible all at the same time. Don’t torture yourself by reading this dreck. Let me do it for you. Samantha and the Cowboy, Lorraine Heath, 2002. As if the title didn’t already tell you exactly how awful it was going to be, the cover gives you another hint. 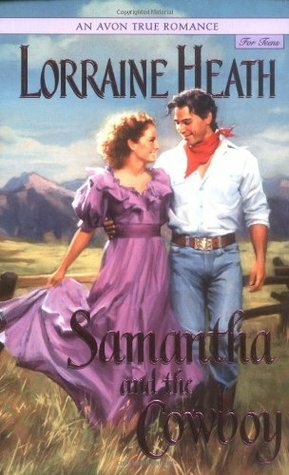 Samantha is wearing a purple party dress that bears zero resemblance to anything anyone would have worn in 1866, and is sporting a frizzy red mullet-esque hairstyle, while the titular Cowboy is wear a pristine white shirt, Wranglers, and is staring at her chest. Also, the price sticker on my copy says it cost seventy-six cents, which is probably about the correct price point for this piece of trash. Anyway, if you’ve ever read any sort of “woman disguises herself for a good cause and falls in love with an unknowing man along the way” fiction, you know exactly what the plot of this story is and you don’t need to read this book. But we will.